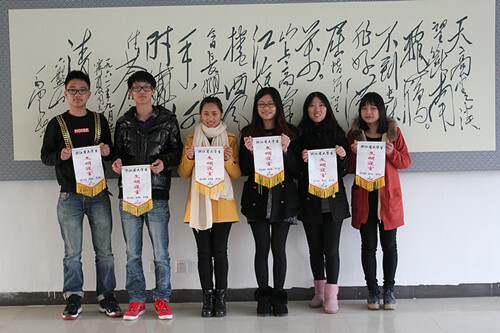 At 14:00 on December 8 ,2013 , a civilization promotion symposium of “My bedroom My Home ‘ was held at the academic center of Zhejiang Financial and Economic University, it is co-sponsored by the Provincial Civilization Office, the provincial League Committee, the Provincial Education committee, some Youth League secretaries and chairmen of student councils attended the symposium. At the beginning of the symposium, mini movies of the selected bedrooms were shown, the bedrooms selected have all been on-the spot surveyed to ensure its fairness. Then, representatives from five universities ( colleges) made speeches for the purpose of the experience exchanging. Mr.Sun Baosheng, Deputy Director of Provincial civic moral education Office declared the rewarding decisions , and gave out the awards for the “advanced units” and “civilized bedroom ” . What is well worth celebrating is that six bedrooms from Changzheng college received “civilized bedroom ” titles. They are: Room 122 of Building No.3 , room 208 and room 434 of building No. 14, room 502 of Building 7 , room 513 of building No. 13 and room 516 of building No.15 . The meeting finished by a speech given by Mr. Xuefei, the director of Publicity Office of the Provincial Education Committee, in which he gave warm congratulations on the winning units .